There have been a number of articles written over the last few years regarding the fact that municipalities do not have the money or resources to repair sidewalks broken up by tree roots. There had been some programs in some California cities that would reimburse homeowners up to one half the cost of repairing sidewalks that have been damaged by tree roots. But as a result of the weakened economy, these programs are not funded, and there is no money to reimburse owners. 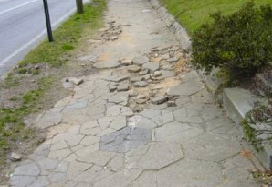 Many associations are concerned about injuries that may occur as a result of heavily damaged sidewalks adjacent to these associations’ common area. Community associations don’t like taking on responsibility for damage that they did not cause, especially when many associations have not increased assessments or maintenance fees and are really limping along financially as a result of the Great Recession. Unfortunately, many associations are looking at potential liability for trip and fall injuries suffered as a result of the broken up sidewalks even if the association does not own the sidewalk or the trees that caused the concrete to become damaged. Cities are responsible for repairing sidewalks damaged by the roots of City trees. However, many cities have been patching them with black asphalt. For example, in the City of Los Angeles, the location is noted and later repaired as part of a grid when surrounding sidewalks are sufficiently damaged and funding is available. If an association in Los Angeles wants to repair the sidewalk (and pay for it), it can obtain a permit “A” from the local Bureau of Engineering office in person or online. The permit fee is waived if the association provides photographic evidence that tree roots are causing the problem. The area is then inspected, and the association can begin repairs. But what about liability for injuries if the sidewalk is not repaired and someone trips, falls and is injured? The California Appellate Court determined that a homeowners association may have a duty to warn or protect third parties about or from dangerous conditions in sidewalks across its property, even when the sidewalk is not owned by the association. In the case of Alpert v. Villa Romano Homeowners Association (located in the Marina Del Rey area of Los Angeles), decided on May 31, 2000, Ms. Alpert tripped and fell on a sidewalk that was adjacent to the association’s property and sustained serious injuries. At her trial against the association, the trial court granted the association’s motion to have the case dismissed (after Ms. Alpert presented her case-in-chief) on the basis that the association did not own that sidewalk. Ms. Alpert appealed the decision. In the Alpert case, Ms. Alpert tripped over a portion of the adjacent sidewalk that had been uplifted due to tree roots growing under the sidewalk. The Court of Appeal determined that because the homeowners association planted and maintained all of the trees and vegetation in the area on both sides of the sidewalk, had installed sprinklers and watered and trimmed the trees which grew the offending roots, the association had exercised sufficient possession and control over the adjacent sidewalk and was therefore obligated to warn third parties of the dangerous condition in the sidewalk. Thinking that your association may not have any liability because it does not maintain the trees? Think again, as the appellate court also concluded that the association’s knowledge about the dangerous condition on the walkway and its discussions about repairing the sidewalk prior to Ms. Alpert’s fall further evidenced the association’s possession and control over the sidewalk, and thus, its duty. 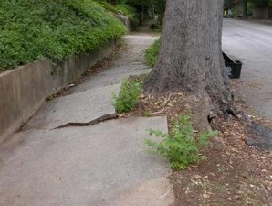 If your association is aware of the problem with tree roots breaking and uplifting the sidewalk, it may have an obligation to make the repairs or possibly face liability for injuries. This case demonstrates that a California community association’s liability for injuries is largely a factual determination of the control and possession exercised over the property in question, as well as the association’s knowledge of the problem. Even if an association is not liable for the injuries, the association may still be named in a lawsuit. What to do? The first and easy answer may be to fix the sidewalk. Also, make sure that the Association has substantial liability insurance to cover the owners from any potential liability.